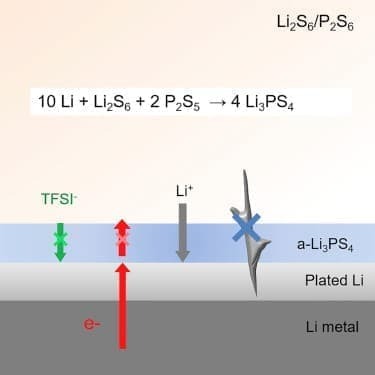 The University of Waterloo researchers breakthrough involves the use of negative electrodes (the anode) made of lithium metal, a material with the potential to dramatically increase battery storage capacity. The increased storage capacity, or energy density, could boost the distance electric vehicles are able to travel on a single charge, from about 200 kilometers to 600 kilometers (360 miles). A single ion conducting protective layer is created on the lithium surface. Image Credit: The University of Waterloo. Click image for the largest view. The first challenge involved the well-known risk of fires and explosions caused by microscopic structural changes to the lithium metal during repeated charge-discharge cycles. The team’s work is truly a counter intuitive success. Its seems after a review of the paper that the technology may be incorporated into battery manufacturing without a complete retooling and massive investment. This may be the breakthrough that more intense use of battery power needs to expand the market for devices. Another vaporware. All these wonderful advances works great in lab, but somehow always fails in the real world. Call me when this is ready for prime time. The EV deniers are so funny. They forget every second of every day a EV is sold. Every hour one less tanker truck is needed to haul oil. Every home in the USA could use one of these. With already 200 plus mile range and most daily use under 60 miles the EV is taking market share daily from the ICE. When the EV range climbs to 400 plus the ICE cars days will be numbers. No one will want them. Every week there is a battery breakthrough. But none have come to market in many years since lithium ion. Believe it when you can buy it. I'm not sure what Henry is going on about. ICE cars still outsell EV's 4 to 1. Which means oil will still be needed for at least a few more decades. Despite politicians trying to cram EV's down our throats with subsidies, ICE car bans and limiting oil industry development they aren't exactly flying off lots. What EV supporters have to realize is the time it takes to get a full charge and the fact they depreciate faster than their ICE counterparts. And I'm not anti electric car by the way. Your typically uninformed viewpoint stating "ICE cars still outsell EV's 4 to 1" is like the MSM saying "Only 1% of car sales are EVs". At the moment only 1% of car production is EVs therefore they all sell and then there are waiting lists. If 30% of all production were EVs they would sell 30%. It is BIG AUTO who has spent 10 years refusing to scale up. So TESLA and new Chinese brands will have to do it all instead. A game changer IF it works, and doesn't cost much more than the existing lithium batteries. Tesla already gets ~250 miles on a charge. You’re estimate of this new battery getting 360 miles/charge is only a 69% improvement, not a 300% improvement over current technology. The ideal EV battery should weigh no more than 30kg,have triple the power of current batteries, it should have good discharge characteristics, i.e. 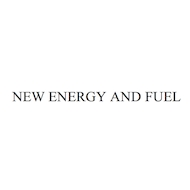 should release the energy evenly and,crucially, should go from zero to full charge in under 10 minutes. @warren trout, I don't agree. In general, revolutions take some time, but evolutions happen all the time. The Litium polymer batteries are far better than the old ones with a liquid electrolyte for instance. @Justin V. We always charge our EV (an Ioniq) at home, so we have no problems whatsoever with charging time. All I know of also charges their EV's at home or at work, or when they are parked on a parking space. Once EVs get sufficient range, ICEs are done. Toyota and others are also working on game changing battery tech. It's only a matter of time until EVs take over. Battery breakthroughs will come and they will come like never before. Battery electrochemistry is still virgin territory for the most part. Cumulative manhours in this area are a negligible fraction of that spent on ICEs. When the ideal battery arrives it will do so unobstrusively. Because the perfect chemistry is out there and it is within technological reach but there are literally millions of chemistry combinations. Sakti3 almost hit that in one of their prototypes, but could never replicate the exact same chemistry - was it an insitu reaction or an impurity that provided the magic sauce? They could never figure it out and went downhill. The misses so far are like the eliminations Edison had to do on his way to the electric bulb filament. The more hours invested in trials, the more someone is closer to that perfect battery. The range will be welcome, but is by no means necessary. Entering 2018, we're just barely getting a decent crop of plug-in vehicles on the market that run the gamut of vehicle classes, including the hot CUV/SUV segments. Plus, there are still huge value propositions out there like the Ioniq PHEV that after incentives, may only be half the price of a Model 3 while having a longer total range. Sure, it's not a full electric, but once people get their first plug-in vehicle, they aren't very interested in going back to an ICE at all and now that they have options in many more categories, they will buy them. Should go without saying that the days of oil are numbered. So how much EMR is the driver exposed to in these vehicles? Must be off the charts!